I feel very fortunate to be able to travel via Airstream as much as I do. But some of the travel isn’t that great, because we are running from one place to another on a schedule. Being on a schedule means skipping interesting roadside sights and enticing state parks because they aren’t convenient for a stop. It means pressure to cover miles, and overnight stays in places that don’t exactly qualify as vacation spots. The past few years have been filled with too much of that sort of travel, and not enough of the type where we lay back and let the days come to us. So to try to balance things out, I decided to take a trip by myself to Organ Pipe Cactus National Monument in southern Arizona. Actually the trip was intended to include my friend Nick, but he got a virus the day before the trip so it became a solo voyage. This was a mental block for a little while because I had anticipated everything for a party of two, and now I would be alone in the Airstream with no real goals or plans. I stopped for a moment to re-evaluate why I was going. This was an opportunity. I have not taken the Airstream out by myself for “no reason” in many years. Every solo trip I’ve had recently (and there haven’t been many) had some sort of quest as the central point of the trip. This time I’d be hitching have up the Airstream, towing 200 miles, and spending a couple of nights far out in the desert near the Mexico border for no reason other than to relax. Eleanor loaded the Airstream up with food enough for several days, and we got it all straightened out for travel, and off I went. As I towed down Rt 86 through the Tohono O’odham Reservation and wide open Sonoran Desert, I got a little more cheerful. I was alone in my favorite place in the world (the Airstream) and heading off to adventures that I couldn’t predict. Fate always seems to hand us a little surprise when we step out of our personal boundaries. 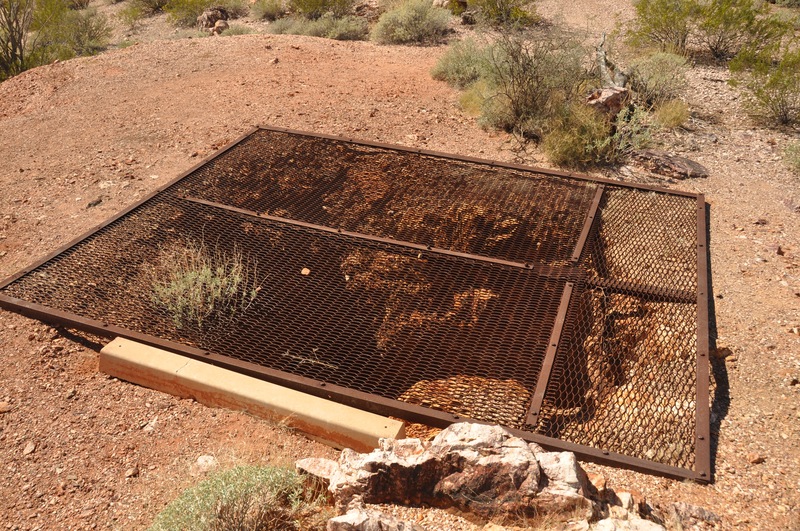 In this case I found a story about Organ Pipe Cactus National Monument that I didn’t see coming. My friends Bert and Janie Gildart were here and Bert and I decided to go for a drive around the park on some of the backcountry dirt roads, to do some hiking and sightseeing. 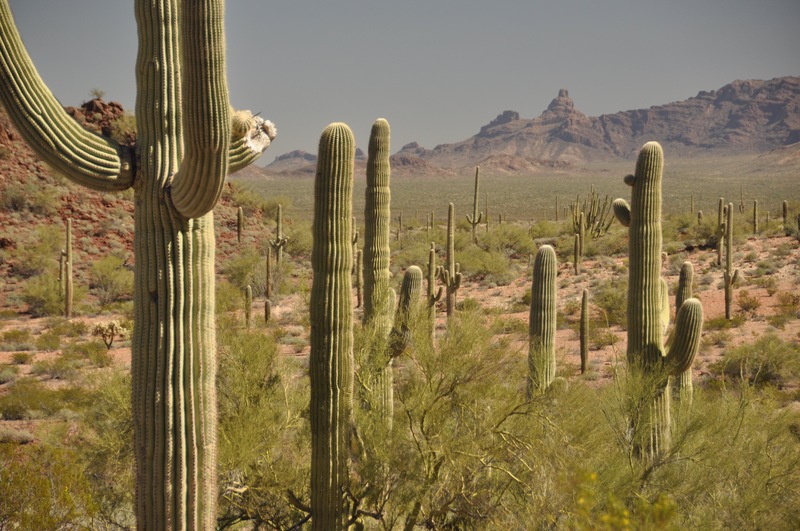 You have probably heard about the reputation of Organ Pipe Cactus National Monument. Virtually closed for many years because of drug smuggling and illegal immigration, it was considered to be a “dangerous” place. In the years leading up to 2012 most of the park was barred to tourists (except in a few cases where they could go only with armed escorts). Even today people think it’s a war zone down here. 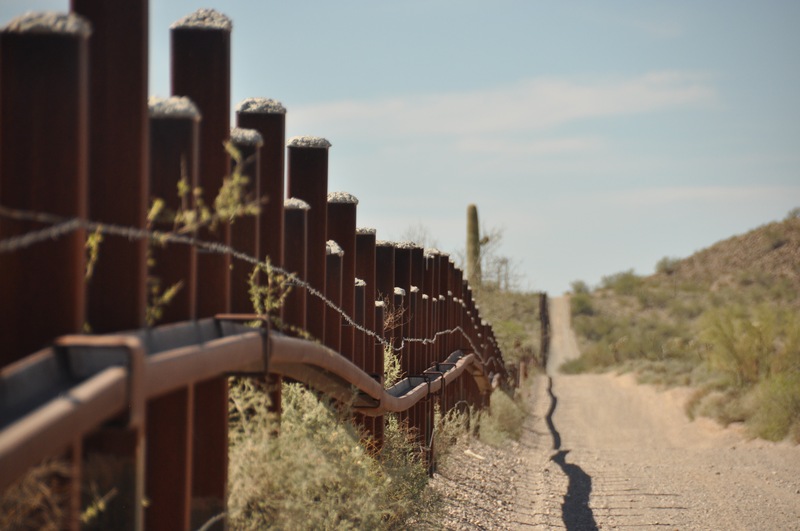 The border fence isn’t what keeps people out. But it’s not. Not even close. I met the Superintendant, a confident guy with law enforcement background. He talked to a bunch of us campers at the park amphitheater and gave the story from his perspective. The park, he said, was suffering from “lore” but not facts. It also had a dysfunctional relationship with the Border Patrol, who were trying to do their job to protect the border without much cooperation. The Superintendant said we’d be hard-pressed to spot any illegals while we were in the park, and that was true while Bert and I were exploring. The smugglers don’t want to be seen, and the Border Patrol scoops up most of them anyway. We actually wanted to find some hints of activity, like some of the black plastic water bottles they leave behind, just because we were curious how successful the park has been at suppressing it. We didn’t find much during our 32 mile backcountry drive, until we were right at the border itself–and most of that trash probably just blew over the border. Instead, we found magnificent cactus forests, delicate desert flowers, hidden springs, abandoned mines and ranches, and blissful solitude. Didn’t see a single other human being for most of the day, until we finally crossed paths with a Border Patrol officer in his truck, who gave us a friendly wave. 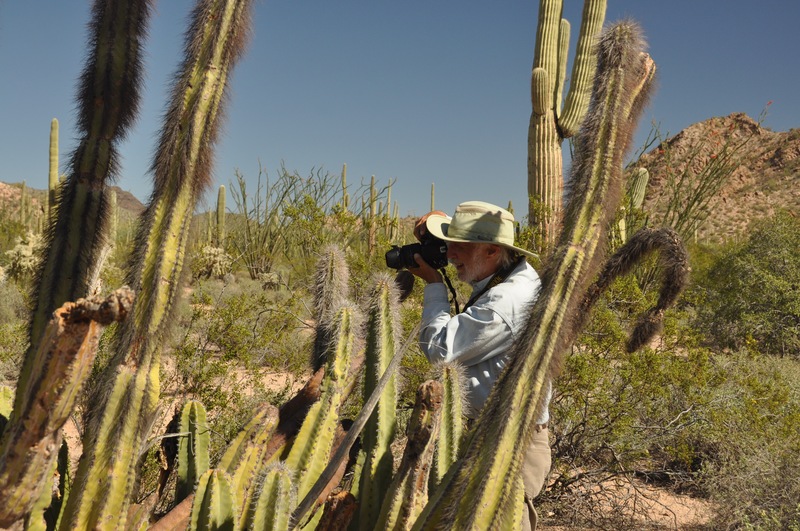 The rebirth of Organ Pipe Cactus National Monument has been spectacular. The park is better than we’ve ever known it, and all the campers here have been commenting on it. They’re wondering why more people aren’t here, enjoying the fantastic weather and stunning scenery all winter. So I’m passing it along: Organ Pipe is open and thriving, and you should get here before everyone else figures it out. For me, I’m reminded that no effort is pointless. I had no preconceptions about coming here, but the National Park supplied me with a purpose and an education anyway. I guess I was wrong when I thought I was coming here for no reason. I just didn’t know what the reason was. Hitching up the Airstream to go see something always seems to pay off. This was a trip with no deadlines, no expectations, and no goals, and yet it has been as fulfilling as any other. Eleanor says I’m not missing much at home right now, so I may as well stay for another quiet and cool desert night. That’s a nice bonus. While I’m here I’ll research a few things to do as a family so we can come back together before the season ends. Organ Pipe may become our winter vacation spot in the future, now that we know it has come back better than ever. ‘Chance is powerful; allow your hook to be cast into the pool where you least expect there will be fish’. Ovid or Homer, one of those guys. Curious, now that media reports “reverse migration”, i.e., more illegals returning to Mexico and central America, than those attempting to cross…will the fences and 550 BP agents in Ajo be activated to retain the migrant exodus ? You have to wonder, who is going to pick the fruits and vegetables, provide landscape service, bus the tables at our favorite restaurant, or housekeep the hotels and resorts ? Our grandchildren in charter schools ? Walls, like Berlin and Swiss cheese, have the shelf life of a coffee filter. 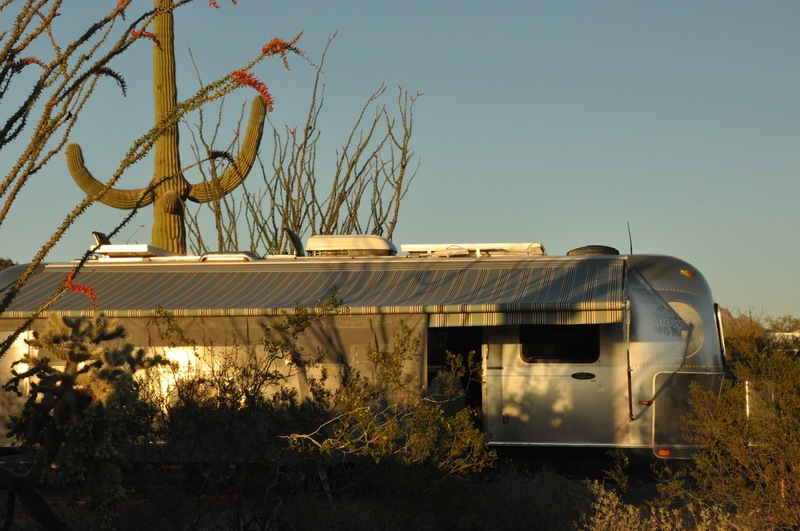 A tip of Bert’s outback safari hat to the Airstream vagabonds on your rediscovery of Organ Pipe. As with you, Rich, we usually do not head out unless the trip has a purpose, such as a club event (monthly!). 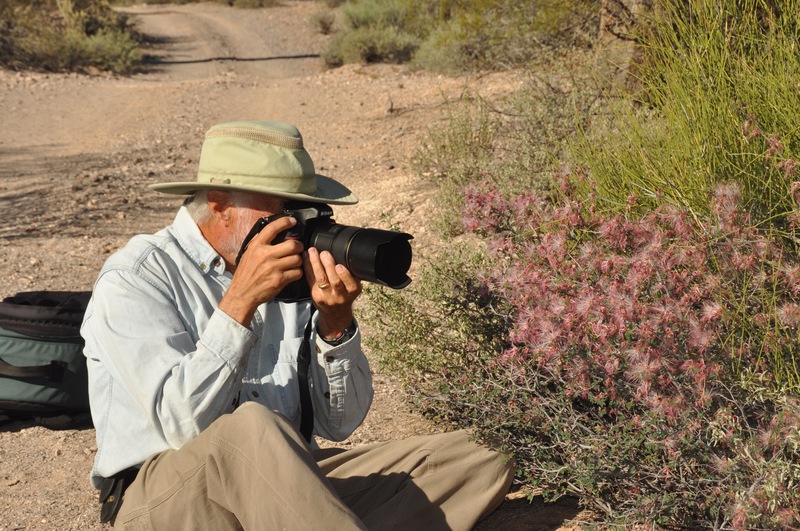 What a great opportunity you had to explore and run into Bert, who we just had the pleasure of meeting while in the Anza-Borrego Desert. Come to think of it, that was an unplanned and welcomed trip in January! Keep rollin’!